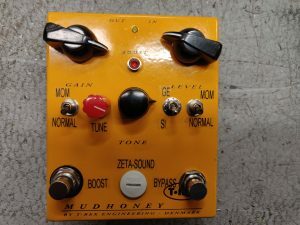 Ever since I made the T-rex Mudhoney 2:nd stage mod the idea has been there to try something similar on a Boss or Ibanez pedal. So here it is on a Boss DS-1 pedal, the feature to choose a latching or momentary bypass. 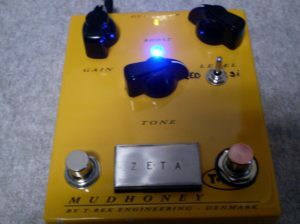 The mod can be performed on any model from Boss or Ibanez that’s using their standard toggle circuit. 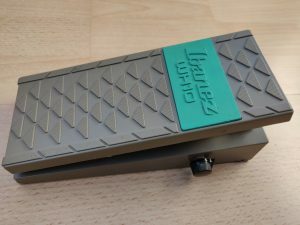 Added a volume pot to an Ibanez WH10 wah pedal. Effecting the volume when the effect is engaged. Installing a threeway switch wich in uper pos lets the circuit clip over AA144 germanium diodes, middlepos no diodes and down pos silicone diodes. Replaced the Boost switch with a stompswitch and a indicating led in its original position. Added an 2:nd circuit board that controls the fet bypass circuitry and has the option of using the stompswitch action as normal latching or momentary. Finaly a Tune pot to balance the gain against the Boost. More Info here. 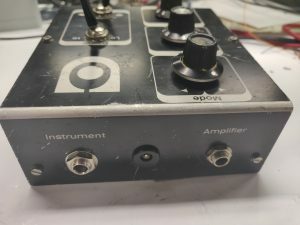 Since this pedal requires two 9V batteries I had it modified with a charge pump allowing it to take a normal 9VDC adapter or one single battery. In the now empty battery compartment I added a pot for the output volume. Installed a threewayswitch wich in left pos lets the circuit clip over red leds, centerpos no diodes and right pos silicone diodes. Replaced the Boost switch with a stompswitch and a indicating led in its original position. 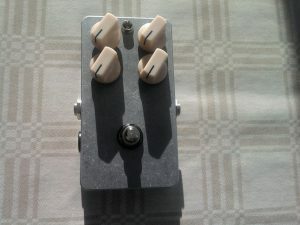 Added some images from a rehousing project of a Danelectro Transparent Overdrive. 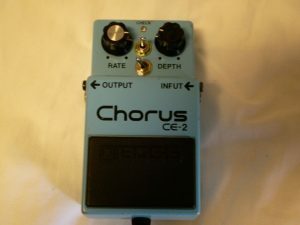 The classic Boss CE-2 chorus moded with chorus/vibrato switch and a speed range selector switch.